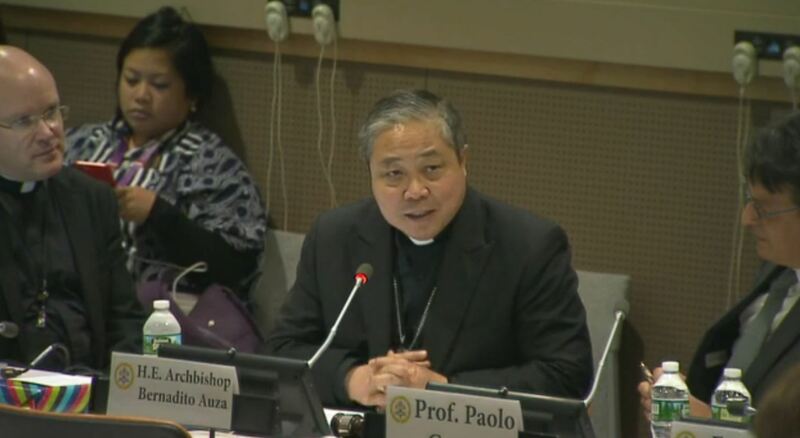 “The 2030 Agenda is a paradigm shift on how to eradicate poverty and promote authentic human development,” said Archbishop Bernardito Auza, Apostolic Nuncio, Permanent Observer of the Holy See, at the High-level Meeting of the United Nations General Assembly on Development Cooperation with Middle-Income Countries, New York, December 4, 2018. The Holy See is pleased to participate in this High-level Meeting to discuss the gaps and challenges that middle-income countries experience in the implementation of the 2030 Agenda for Sustainable Development. The 2030 Agenda is a paradigm shift on how to eradicate poverty and promote authentic human development. The old paradigm had a one-dimensional approach: first, promote economic growth and then, somewhere in the future, you could afford environmental protection and social benefits. The new paradigm sees a reciprocal approach: social, environmental and economic progress must go hand-in-hand. Countries cannot wait until they are rich to promote human rights, support education, and healthcare or protect their environment. A more effective strategy is needed to invest in education and healthcare, especially for women and girls, while ensuring a just transition of the workforce that creates decent work and quality jobs, as reaffirmed yesterday at the Leaders’ Summit in Katowice. Real economic progress starts with and is directed toward integral human development, protecting human dignity and promoting the common good. Furthermore, the previous paradigm facilitated economic progress for the few that often came at the expense of the many, and especially of the poor. As Pope Francis noted, “Developing countries, where the most important reserves of the biosphere are found, continue to fuel the development of richer countries at the cost of their own present and future.” This “ecological debt” is one of the barriers to convergence between middle-income countries (MICs) and high-income countries. My Delegation considers the so-called “middle-income trap” as a form of an “economy of exclusion.” Convergence will come when the MICs are able fully to capture the benefits of the economic activity taking place in their countries, rather than having to bear the economic, social and environmental burdens while exporting the benefits to already rich countries. Other barriers to convergence include exclusionary agricultural policies that make it hard for MICs to compete in global markets and tax policies that help large companies avoid paying taxes in MICs. The Holy See is thus calling for a bottom-up approach to build an “economy of inclusion” through genuine participation and participatory democracy, whereby people become the agents of their own development, and whereby those affected by policies, in turn, can affect policies. For this vision to be realized, however, the global economy needs a re-orientation away from an ideology of the unregulated market and profit at all costs toward the common good of all. This requires a reconstituted ethical tradition predicated on the full flourishing of the human person. This is possible if we focus on linking human dignity to the common good and if we properly interpret key concepts such as freedom and rights: a qualitative approach to freedom tied to responsibility, and social and economic rights underpinned by a reciprocal obligation between the individual and the community. Such a framing can provide fertile ground for integral and sustainable human development in middle-income countries. It can help form better individuals and better institutions. It can help to replace a globalization of exclusion and indifference with a globalization of inclusion and solidarity. 1. Pope Francis, Encyclical Letter, Laudato Si’, n. 52.